When you download apps or games from Google Play, you may occasionally run into errors. Google Play Store errors occur if you have problems with your device, your internet connection, or Google Play Services. Instructions in this article apply to all smartphones and tablets running Android 6.0 (Marshmallow) or later, but some steps may vary slightly depending on your device's model. Before you begin troubleshooting Google Play errors, visit Downdetector.com to see if other users report problems with Google Play. If so, the issue likely lies with Google Play Services, and it will resolve itself soon. Error 944: Google’s servers are having connectivity problems, wait until the problem is fixed. Errors 919, 101, 923, and 921: Your device is out of storage space. Delete some apps to make room. Consider moving your music, pictures, and videos to cloud storage. Error 481: Your Google account has been shut down due to an error. The only solution is to delete it and create a new one. Error 927: This error code appears when you download an app while the Google Play app is updating. Wait until the update is finished installing, and then try your download again. Error F-BPA-09: This download error is caused by problems with Google or the app itself. Clear the Play Store app's cache data by going to Settings > Apps > All > Google services framework. Error 505: Similar apps are trying to access the same permissions. This is only a problem with older versions of Android. Clear the cache via the app settings and install the latest Android update to prevent this issue. Error DF-DLA-15: This code relates to app updates. Clear the Play Store app cache to fix this error. Error 103: Your device is incompatible with the app you downloaded. Google Play typically doesn't let you download incompatible apps, but sometimes it does. You may also get this code erroneously. Update to the latest versions of Google Play and Android. Error 491: No downloads or updates are possible due to a technical issue. Try removing, then re-adding your Google account on your device. Error 403: This error happens when you download the same app using different Google accounts on a single device. Sign in to the Google account you originally bought the app with and uninstall it before you download it with your other account. You may also need to clear the Play Store search history by going to Play Store Settings > Clear search history. Error 911: This code indicates a problem with your Wi-Fi connection, or you may need to clear the data cache. If you use a hotspot with authentication requirements, log in again. Errors 941, 504, 495, 413, 406, 110, rh01, and rpc:aec:0: These errors occur for various reasons, but they all require the same fix. First, clear the cache. If that doesn't solve the problem, use a different Google account. Assigning a new Google account to your device can cause compatibility issues with some apps, so you may need to reinstall the apps before they will work properly. You won't always see a code when Google Play unexpectedly stops working or misbehaves, so you may have to perform some troubleshooting to identify the underlying issue. If Google Play malfunctions without giving you an error message, there are plenty of strategies you can try to get it working again. Google Play is optimized for Android devices. 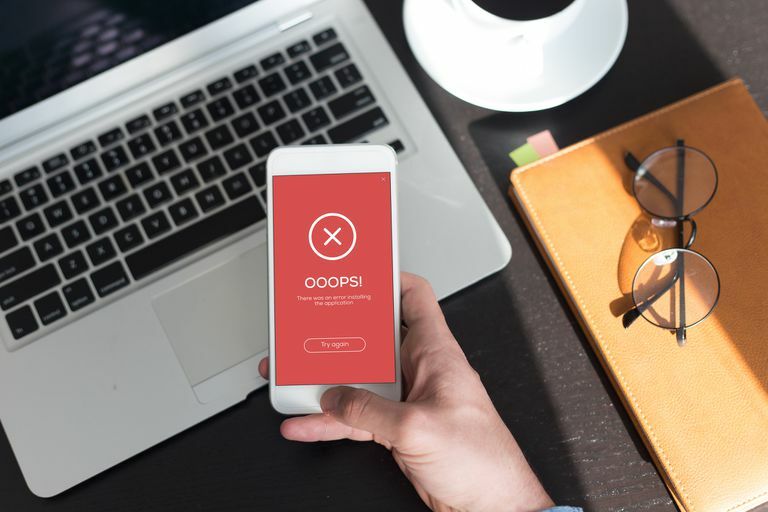 Although it's possible to install Google Play on Amazon Fire tablets and iOS devices, the following strategies may or may not fix Google Play Store errors. Restart your device. Turn off your device and turn it back to resolve a surprising number of issues. Open the Settings, then tap Apps. Locate and tap Google Play Store. Toggle airplane mode. Although it's unclear why, many users report turning airplane mode on and off corrects Google Play's behavior. Swipe down on the screen and tap Airplane twice. Toggle Wi-Fi. Disable Wi-Fi for a few seconds, and then turn it back on. Swipe down on the screen and tap the W-Fi icon twice. Reset your router. If you have trouble with other web apps, there could be an issue with your internet connection. Eject the SD card. SD cards can cause issues with Google Play if not set up properly. Remove the SD card and re-insert it when you're done. Go to Settings > Apps > Google Play Store, then tap Storage. Delete Google Play Store data. Follow the same steps as above, but tap Clear Data instead. Afterward, sign in and go through the initial set up process again. Go to Settings > Apps > Google Play Services, tap Storage, then tap Clear Cache. Tap Manage Space, then tap Clear All Data. Check disabled apps. Google Play depends on other apps to run, some of which can accidentally be disabled. Go to Settings, scroll through the Apps list, and look for apps with Disabled beside them. Tap each one, then tap Enable on the app info page to see if that fixes the problem. Disable Proxy Server/VPN. If you use a virtual private network, or any other type of proxy server, turn it off. Check the system date and time settings. Inaccurate date settings cause conflicts with Google’s servers, so navigate to Settings and tap Date & Time. Tap Automatic date & time. You may be asked if you want to use the time provided by the network you're currently connected to, or your device's internal GPS. Both options produce the same result. Update Google Play Services. Visit the Google Play Services app page and tap Update. If you see a Deactivate option, then Google Play Services is already up to date. Update the Android OS. Go to Settings > About phone/tablet. Tap Firmware update (or System update on some devices) to see if it's possible to upgrade. If you have an older device, you may need to root your Android device and side-load the update. Navigate to Settings > Apps and tap Google Play Store. Then, tap the three vertical dots in the upper-right corner on the app details screen. Restart your device. The most current updates install automatically. When Google Play finishes updating, download the app again. Open Settings and tap Accounts. Tap the three dots in the upper-right corner of the window, then tap Remove account. Go to Settings > Accounts > Google once again. You'll be prompted to re-enter your account information. Clear the Google Play Services cache and data (as detailed in step 9 above). Then, open the Google Play Store to see if the problem is resolved. Use another Google account. Follow the steps above to remove your account, but assign a different account instead of re-adding the old one. If multiple accounts are listed when you go to Settings > Accounts > Google, the first account is the primary account for your device. To change the primary account, delete the current one (you can re-add it later). Go to Settings > Apps, then tap Downloads. If you don't see Download Manager listed in the Apps list, tap the three vertical dots in the upper-right corner, then tap Show system. Reset your device. Performing a factory reset on your Android device returns your phone or tablet to the state it was in when you bought it. This may fix your problem, but it also deletes everything you downloaded and saved, so save this step as a last resort. Backup your important data before performing a factory reset. If you encounter other error codes not listed above, a quick Google search will give you some insight into which solutions might fix your problem.